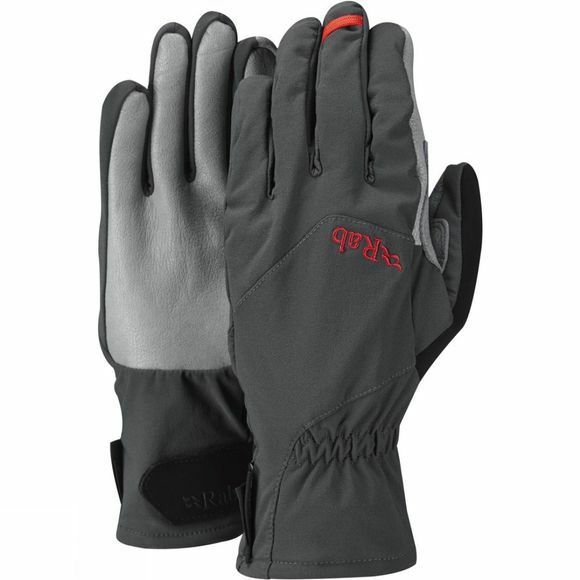 The Rab Vapour-rise Glove is a very lightweight breathable glove that will offer wind and water resistant protection for all your outdoor needs. It has a Pertex Equilibrium shell with a hardy patch of Pittard's Armortan leather on the palm for reinforcement when scrambling and climbing. The wrist is part elasticated for easy on and off while a hook and loop cuff can be secured to ensure a snug draft free fit. A small loop on the back of the finger on each glove allows them to be attached to a climbing harness with a karabiner so they can always be kept handy.